Sushi and Mushroom Salad... for Dessert!!! 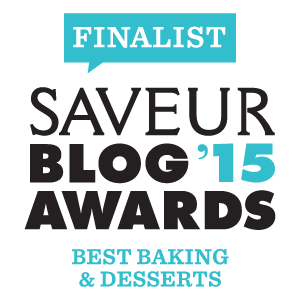 Saveur Magazine's Food Blog Awards!!! When I found out the news a few days ago, I was completely stunned. I can't BELIEVE that my blog was re-nominated; all I know is that I'm pretty sure that it's because of YOU GUYS. I'm beyond grateful and thankful for all your support. It really means the world to me. Really and truly. The winner of the award will be decided by votes, so I would really appreciate it if you took the time to vote for me. And of course, be sure to check out all the other amazing blogs that also made the shortlist. I'm beyond honored to be a part of the ranks!!! 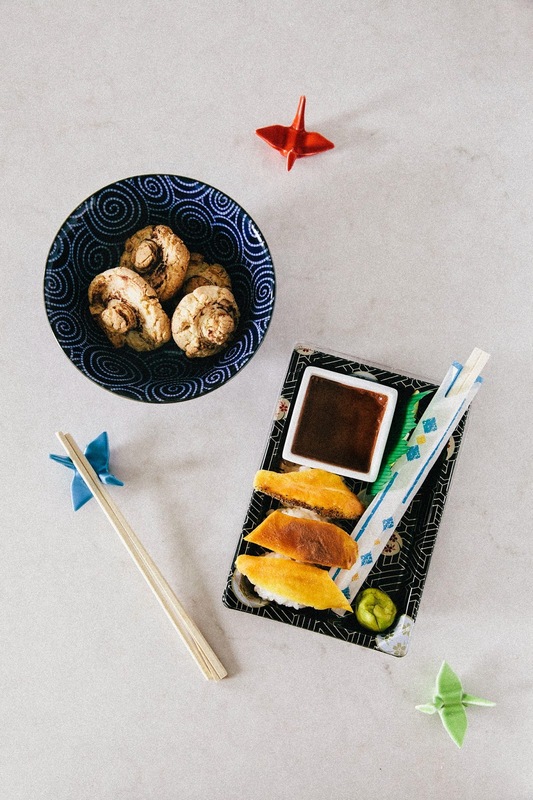 Today I'm sharing one of my favorite recipes: sushi and mushroom salad... for DESSERT. Okay, wait. I can hear you thinking to yourself. What's the joke here? Has Michelle just lost her mind? I mean, is she just eating raw fish and mushrooms for dessert, or what??? Well, look at the pictures. Look closely this time. And of course, you didn't really think that I would let you eat mango and coconut sticky rice with real soy sauce and wasabi now, did you? 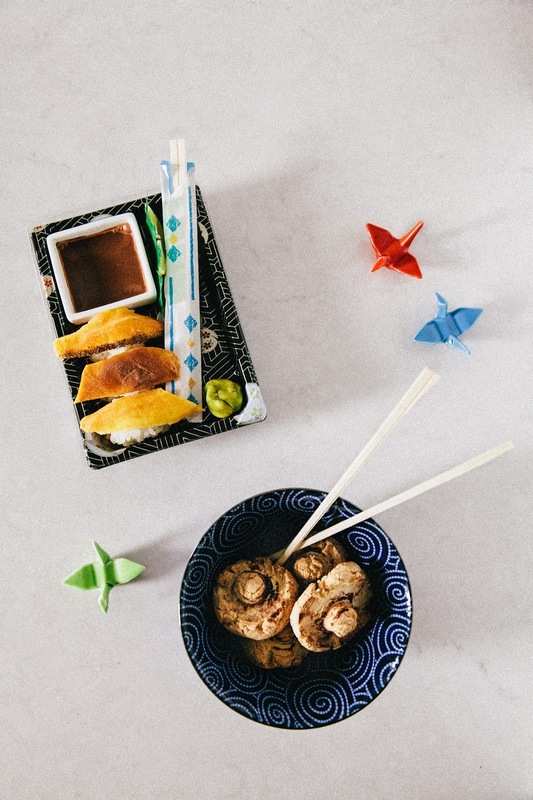 The little ramekin is filled with a chocolate dipping sauce, while the so-called "wasabi" is actually a little clump of marzipan that's been rolled in matcha green tea powder. That goes much, much better with the mango fruit and sticky coconut rice than, well, the real versions. That's right. Those mushrooms up top are actually plain old sugar cookies! I rolled the cookie dough into little balls and used an empty beer bottle lined with cocoa powder to stamp out stumps in each cookie. It's a genius recipe from the cookbook of Sprinkle Bakes, who also happens to be one of my favorite food bloggers. Happy April Fools' Day! I hope I didn't freak you out too much with this recipe. Because like, real sushi for dessert?! NO THANK YOU (although I will eat as much real sushi for lunch, dinner, and snacks as I can — it's one of my favorite foods). I'm really not crazy, I swear. Go crazy with this one! It's April Fool's Day, after all. 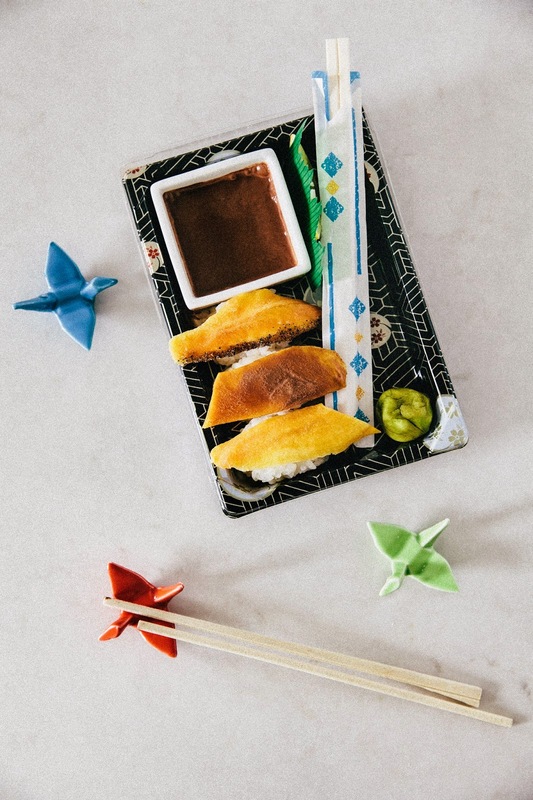 You can use a ton of different dried fruit to mimic the look of sushi — I used mango because I felt like it mimicked the pastel colors of traditional sushi best, but dried papaya with its orange hue would also be a great substitution. And of course, you can always use fresh mango but I am a mango snob and only eat mangos when I'm in the Philippines. Sticky rice is available at Asian supermarkets, or online. You can also use Japanese short-grain rice, but your dessert won't be as sweet. I just cooked my sticky rice in a rice cooker, but you can be hella legit and steam it, or simply cook it in a regular saucepot. I won't include instructions on how to make the rice, however, since different brands instruct you to cook it in different ways, with slightly variant ratios of rice to the water. It's best to follow the instructions on the packet for the best results! Admittedly, the coconut sticky rice was a bit of a pain to form by hand (it's super sticky... like, really). You can buy a nigiri sushi mold to make your life easier, but I'm a cheapo who repurposed an ice cube tray in my fridge to mold the rice — hey, it also works! In a medium bowl, use a rubber spatula to toss together 1 cup cooked sticky rice, 1 tablespoon desiccated coconut flakes, and 1 tablespoon granulated sugar. It'll be quite sticky, but persevere! Just continue tossing until it looks like the coconut and sugar have been dispersed evenly throughout the rice. Use a 1 tablespoon cookie dough scoop or a measuring spoon to measure out 1 tablespoon of sticky rice. Press into the nigiri sushi mold/ice cube tray to form the rice portion into rectangles. If the rice sticks to your hands, fill a small bowl with water and wet your fingertips for easier shaping. Continue until you have around 16 rice portions (note that you might have to divide the work into two; my ice cube tray only held 12 cavities). Chill the shaped rice in the refrigerator for 30 minutes, or until the rice can be unmolded without sticking. In the mean time, prepare the dried fruit. Use your kitchen shears to cut 16 strips of dried mango to the approximate length of the rice mounds you just made. I cut one end of the fruit in a diagonal shape for a more realistic look. Divide the dried mango into 3 portions. You can leave the first third as is for a "natural" look. Take the second third of fruit and dip one of its longer sides in a small bowl of water, before dipping it in a small bowl 1 teaspoon of black sesame sugar. This will give the fruit a "seared" look on one side. For the remaining pieces, take your thumb and dip it in a small ramekin containing 1/2 teaspoon natural unsweetened cocoa powder. Use your thumb to smear the cocoa powder onto the surface of the remaining fruit pieces to give them a slightly different look from the "natural" pieces. Once the rice is ready, unmold each mound onto a piece of wax paper and carefully lay the prepared fruit slices, placing one on the top of each mound. Use your kitchen shears to trim or shape the fruit as necessary. Voila! You're a sushi chef now. In a medium saucepan over medium heat, whisk together 1 2/3 cups granulated sugar, 1 1/4 cups water, and 2/3 cup natural unsweetened cocoa powder until well combined. Bring to a boil and let bubble for 1 minute. After a minute, remove from heat and stir in 1 teaspoon vanilla extract. Transfer to a soy sauce ramekin immediately. If not using immediately, transfer to a jar and store in the refrigerator, and heat again before serving. The sauce tends to get cloudy when it's cold. For the matcha mazipan wasabi, roll 1 tablespoon of marzipan into a ball using your hands. Roll the marzipan ball in a small bowl containing 1/2 teaspoon matcha powder until the marzipan color takes on a vibrant, green hue resembling wasabi. Center a rack in the oven and preheat to 375 (F). Prepare a baking sheet by lining with parchment paper or a Silpat mat. In the bowl of a freestanding electric mixer fitted with a paddle attachment, cream together 1/4 cup unsalted butter and 1/2 cup granulated sugar on medium -high speed until light and fluffy and doubled in size. Add 1 large egg and 1 teaspoon vanilla extract and continue beating until well combined. Lower the mixer to its lowest setting and add 1 1/2 cups cornstarch, mixing together until just combines. With the mixer still on its slowest speed, gradually add 1/2 cup all-purpose flour and 1 teaspoon baking powder until just combined. Stop the mixer and knead the mixture with your hands until it starts to form a solid mass and come together. Let stand for 5 minutes. After 5 minutes, use a 1 tablespoon cookie dough scoop to portion out generous 1 tablespoon portions from the dough. Roll the portions into balls between your palms. The balls should be about the size of a walnut. Place the balls on the prepared baking sheet. Place 1/4 cup natural unsweetened cocoa powder in one bowl, and 1 tablespoon water in another. Dip the mouth of the bottle into the water, before dipping it into the cocoa powder. With a dough ball cupped in the palm of your hand, press the mouth of the bottle into the top of the ball to create the mushroom "stem". Clean the mouth of the bottle every 2 to 3 uses with a paper towel. 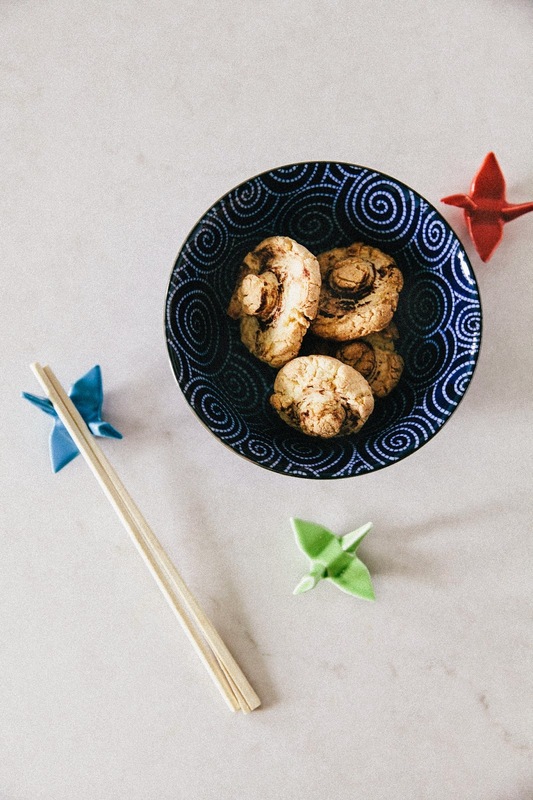 Return the sculpted mushroom cookies to the baking sheet and bake in the preheated oven for 25 minutes, before turning out onto a wire rack to cool completely. Yayy congratulations! Love this dessert sushi idea, the sticky coconut rice sounds so good. This is hilariously awesome :-) How did you wait for weeks to post this? ;-) Congratulations on the nomination! This is such a cute practical joke! All jokes should involve dessert esp. when they flavoursome as these petite fours. 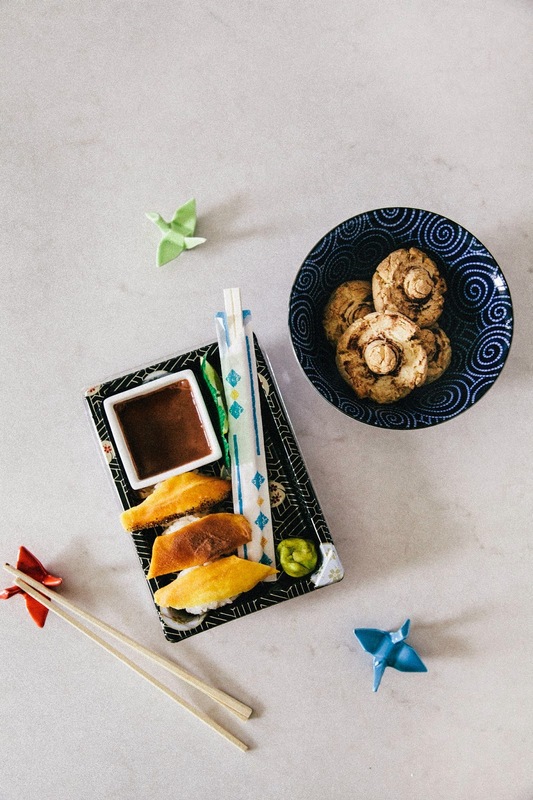 I really love the idea of chocolate soy and marzipan wasabi; so very creative Michelle! Oh gosh Michelle I'm sitting here giggling at this. This is TOO FUNNY. and amazing. You are a genius to think of something like this!! I want to make this for my husband (who LOVES sushi and is a sushi snob) and see his reaction. Haha! Most brilliant food related/blogged April fools joke yet. Loved this! You're too cute and hilarious. Hi Michelle! What a clever invention! Haha, very funny & yummy. And you have my vote :). xo! Love the set up of these. Totally adorable. Happy April's Fool! Thank you Belinda!!! I like that you call the sushi "petit fours"; way to keep things classy! I was just like "SUSHI AND COOKIES GUYS"
Thanks Molly!!! When I was making it, I was actually thinking to myself that this was like all of your favorite things, lol lol. Glad I delivered! HAHAHHAAH please let me know WHAT happens. That sounds like a hilarious 'gotcha!' waiting to happen. Hahha, thanks Sze Wa! Happy April Fools! I love that it's a trick but it still sounds delicious. The mushrooms definitely had me fooled- they look incredibly realistic! Yay on the nomination, this post is clear evidence of how well deserved it is! These are fantastic, all I see in the mushroom salad is.... mushroom, no evidence whatsoever of cookies. I've been munching on champagne mangos since they've popped up in the grocery store, but my boyfriend looks at me in disappointment every time I do! This is so funny, definitely trying this at some point. 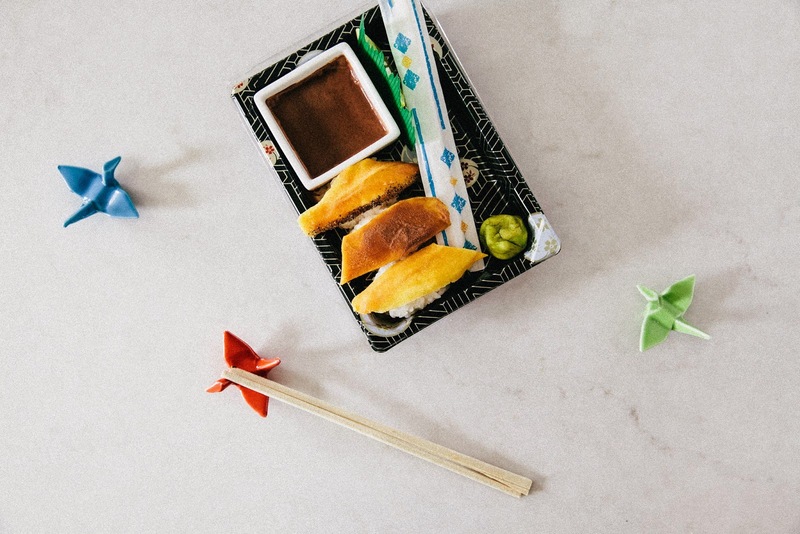 Also, in LOVE with those crane... chopstick holders!? Soooo cute. That was the goal — why bother making it if it's not going to taste good?! Hahah, us SE Asians are picky about our mangos! Glad I'm not the only one who has intense mango snobbery! Yay! Glad my April Fools' trick worked! Also, yay for Heather at SprinkleBakes! She really is one of my baking heroes! 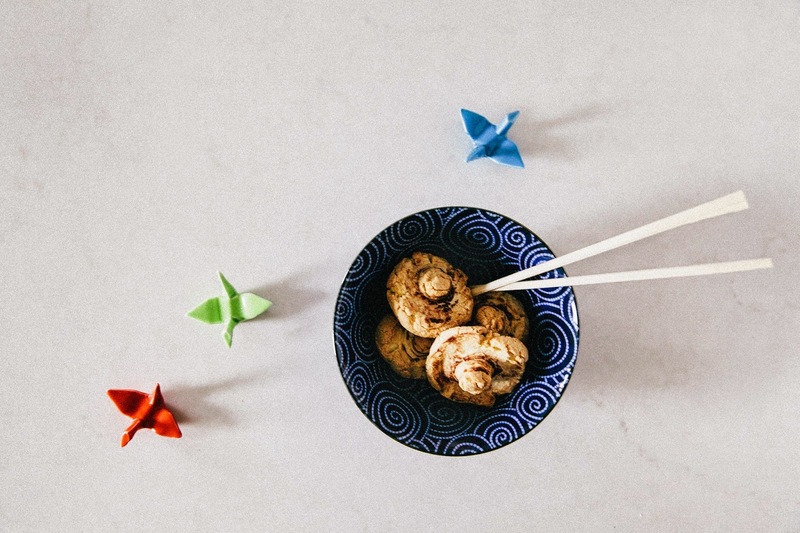 Aren't those crane chopstick holders the cutest??? I think you can buy them online at Amazon; I got them at a local bookstore, powells.com, over here. Congratulations on the nomination! Well deserved! 1) This sushi is amazing. I'm not a huge sushi person because I don't eat fish so this is totally up my street. 2) I'm so, so, so thrilled that you got nominated again and I'm super proud of you (is that weird? Probably). Your first nomination was how I found your blog in the first place and I've so loved getting to "know" you since then and the quality posts that you put out week after week never fails to astound and inspire me. Well aren't you sneaky! I did dessert sushi back in November for my blog-iversary but yours is WAY more sophisticated. Ha! I love real mushrooms but I bet I would love these ones even more. And congrats again on the Saveur nomination!!! CONGRATULATIONS!! I seriously can't wait to hang in NYC! And you are the cutest, ever. Love every last detail of these sweet little sushis. And those mushroom cookies!? Your fake sashimi (and sushi) skills are on point lady! That last mango strip dipped in the leftover sesame is my favorite. Thank you so much kristie!!! I am completely over the moon about it! I didn't know you didn't eat fish! Interesting. Thank you for your kind words about the nomination! I was super stoked to have made the finalists again this year; I honestly thought the one from a few years ago was a fluke. I also missed the ceremony, so I'm just glad to be able to go again this year! Oh my gosh, I remember your dessert sushi! I remember thinking the illustration was super cute and that it was such a cool idea. Great minds yo! And re: Saveur, thank you! I'm beyond excited to meet everybody in real life finally! HAHAH if you saw how much I cursed and grumbled while I was rolling the rice, I think you would say otherwise. Can't wait to hang out in NYC!!! Congratulations on your nomination, Michelle! And ooh, I love this "sushi". What a creative April Fool's Day recipe! I usually stick to the toothpaste-in-oreos trick, but will HAVE to keep this in mind for next year. Thank you, Abby! And somebody totally fooled me with the toothpaste Oreos trick last year; I'm still scarred. That makes those skills even more impressive!! And YAY FOR NYC!! seriously though - ______________ - !!!!! Sooooo obsessed with this, Michelle! The mushrooms are seriously a tromp l'oeil work of art. ALSO: I may need to get you to amend your mango referendum to include Maui mangos. Juicy. Heaven. In your mouth. What kind are the ones you love in the Philippines? Oh, and OBVI huge mega CONGRATS!!! Not a surprise to me ; ). I'm on the lookout now for some around stores here. No reason or occasion to buy them but... I just can't resist cute things for the kitchen!! I'll have to try Maui mangoes! Ooooh. Someday we'll all have a big mango tasting party and it'll be THE BEST. I would add the zest of 1 lemon in to the sugar of the cheesecake, and use a drop or 2 of lemon oil for flavor.